Buttler was batting on 69 at that point in time. Kings XI Punjab (KXIP) are currently playing their opening match of this edition’s Indian Premier League (IPL) at the Sawai Mansingh Stadium in Jaipur. There has been some jaw-dropping cricket in the game with runs flowing from the willows of the likes of Chris Gayle, Jos Buttler, Sarfaraz Khan, and others coming to the party. In the meantime, the game was a witness to a massive controversy. 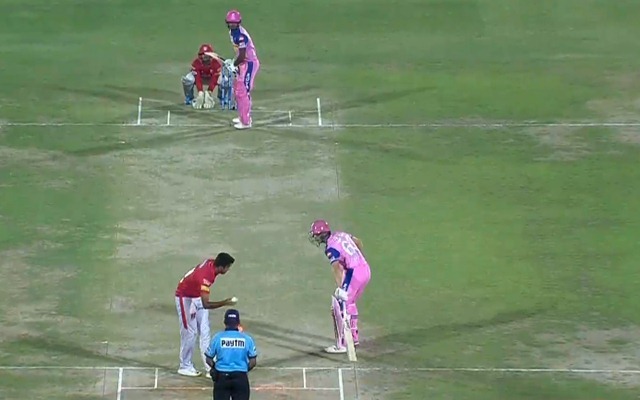 The incident took place in the 13th over of the Royals’ run-chase after the visiting team, led by Ravi Ashwin, put on a significant 184 for the loss of four wickets in 20 overs courtesy of a special knock of 79 from 47 balls with eight boundaries and four sixes. As far as the controversy is concerned, it took place between Jos Buttler and Ashwin and it turned out to be a heated one. Buttler took the Royals off to a stupendous start and he carried on his form from the previous season. He stitched together a stand of 78 runs from 49 deliveries. He was looking ominous for the visiting team, but then came in Ashwin and pulled a rabbit out of the hat. When Buttler was batting on 69 runs, the Indian bowler ‘Mankaded’ Buttler at the non-striker’s end. Ashwin generally has a habit of taking a pause before sending down the ball to the batsman. While bowling he noticed that Buttler was outside his crease and in the meantime, he took the bails off. The Englishman was absolutely surprised and he didn’t have much idea about what was happening. Buttler, the umpire and Ashwin had a heated discussion thereafter. Eventually, it was Buttler, who had to walk off, dejected. While walking back, he vented out his frustration by shouting. In the meantime, Twitter expressed its opinion on the matter. It’s LITERALLY in the LAWS OF CRICKET. No warning needed. Anyone who says “there should be a warning” is a batsman. Out is out. There’s absolutely NO difference from being out stumped. In fact, you know what? Call it a stumping.